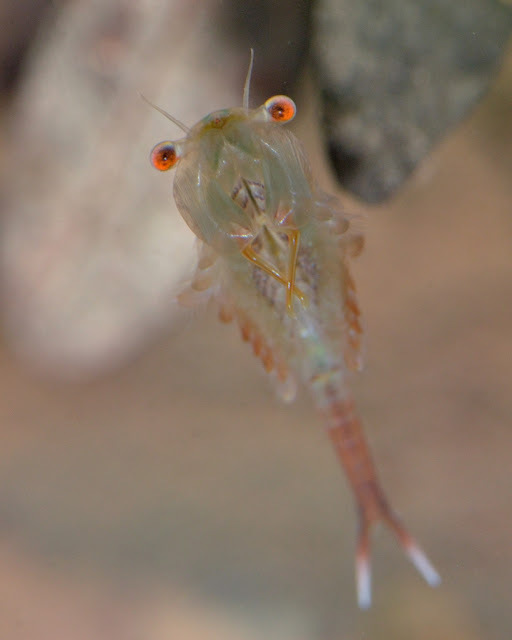 I want to share some photos and videos of the fairy shrimps because I was mesmerized again by their unusual qualities - that happens every time I see these weird-looking critters. Not only do they look like the whimsical creation of an artist, but they are unusually delicate and mostly translucent. Best of all, their movements are ethereal - like a silent Wood Thrush song floating through the water. 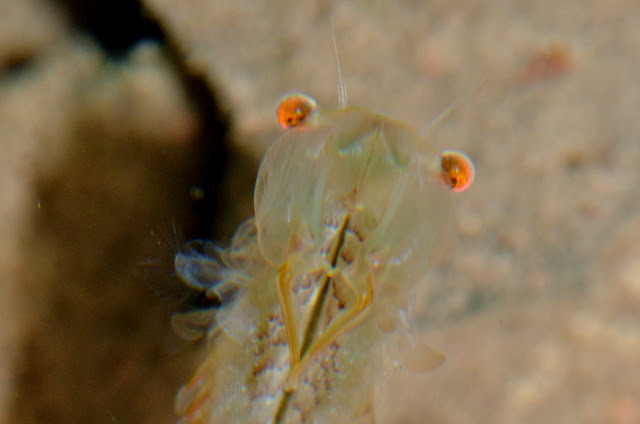 Here is a close-up photo of a fairy shrimp. This is a female, as you can see by the brood sac full of eggs and her lack of the extra long clasping antennae the males possess (see the other photos). 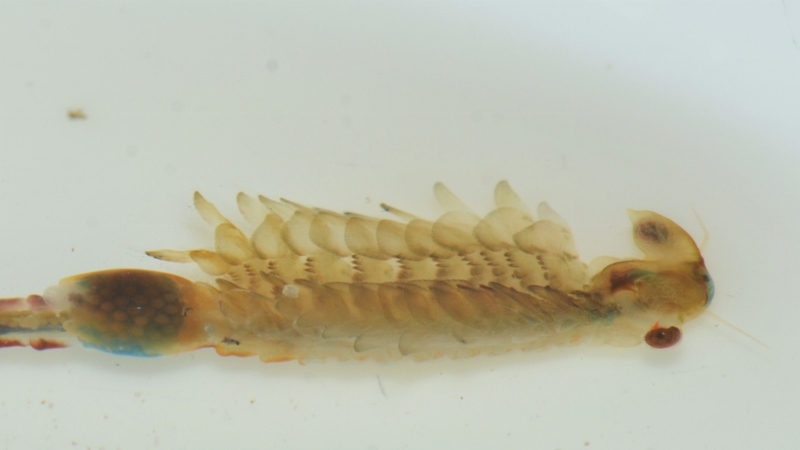 This photo shows the fairy shrimp's 11 pairs of paddle-like "legs". These swimming appendages are also called gill-feet. These paddle-feet are multifunctional... they are used as gills, used for locomotion, and are also used for gathering food particles. In this next video, see for yourself the mesmerizing motion of the fairy shrimp's paddle-like swimming appendages. In this next video of the fairy shrimp, I slowed down the video part way through in order to show the rhythm, or motion, of the the beating gill-feet. Notice the translucent fringes on the gill-feet in these next photos. 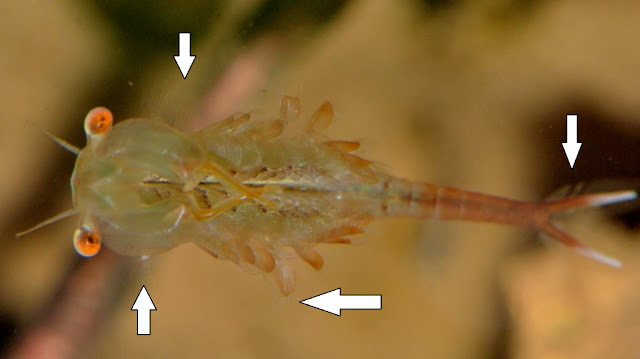 This next photo has some arrows pointing to various appendages where the translucent fringes are visible. What a wonderful water creature! ...and to think it exists only for a short time in temporary pools of water. When I showed the fairy shrimps to my boys, they were enthralled. The boys called the fairy shrimp, "THINGS", and said, "Whaaaat?!? Those THINGS live in Pennsylvania?" My boys also discussed how they think these creatures look more like something that they would expect to see in an Amazon jungle. I have taken the boys to vernal pools before, but because of all the other interesting things, failed to point out the fairy shrimps. 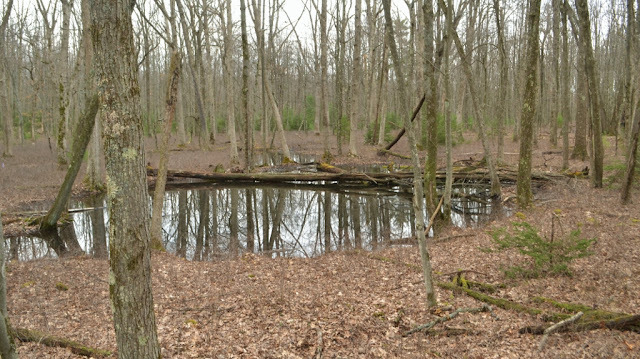 Somehow I missed showing them what may be the "crown jewel" of the vernal pool. When I was young I could go way out in the woods to Grandpa's frog pond. Many years later I still enjoy visiting any vernal pool because of all the amazing things that transpire there before the summers heat and the thirsty trees dry up the pool. Here's a photo of the vernal pool where I recently took the photos of these fairy shrimp. ... No wonder I've had a life-long fascination with frog ponds. Dana, these images are amazing. 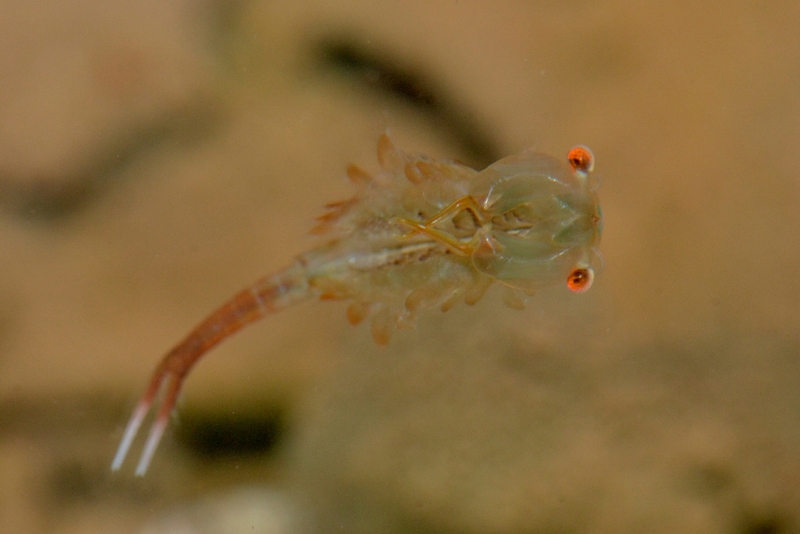 The fairy shrimp's movement in the video is almost poetic. "Whaaaat?!? Those things live in Pennsylvania?" Last Night Was Salamander Night!